Aerobic BOD (Biochemical Oxygen Demand) removal is accomplished by direct removal of particulate organics and indirectly through the biological activity of the filter. AST’s bead filters can be configured to do both. A floating bead media filter acts as a fixed film reactor with bacteria growing on the surface of the beads in a layer that is a hundreds of microns thick. If biological activity is desired, the filter must be managed to encourage the culture of heterotrophic bacteria. Typical control issues include flowrate, substrate concentration, oxygen supply, backflush frequency, temperature, and pH. Fortunately, development of a heterotrophic fixed film is a natural process easily accomplished in an expandable granular format. All PolyGeysers used as biological filters should employ EN media which displays a better porosity and provides protection for the biofilm during high frequency backwashing events. The units display a high specific surface area for biofilm development in the range of 1100-1200 m2/m3. Bead filters can be operated in a wide variety of BOD concentration regimes. The PolyGeyser units are virtually impervious to biofouling, and with a high backwashing frequency, they can be effectively used as roughing filters reducing particulate BOD of raw wastes with high BOD and TSS concentrations. Roughing filters are managed with a high frequency of backwashing (down to about once an hour) to prevent clogging of the bed. 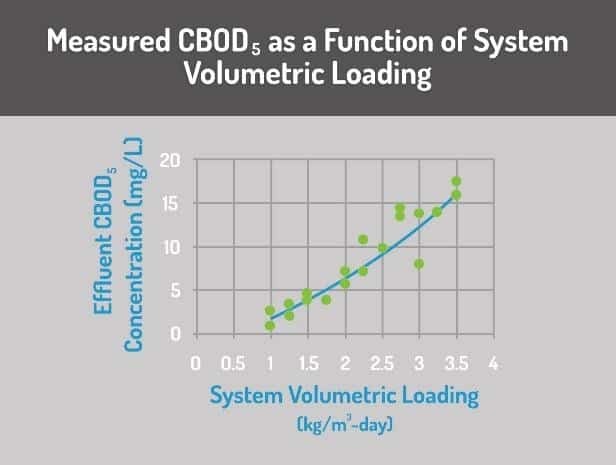 Peak conversions on waste streams with CBOD5 levels below 100 mg/L typically fall in the 3-6 hour backwash interval range. Rapidly growing biofilms uptake dissolved organics producing biomass that is then removed before the demand can be fully expressed reducing oxygen demand. Conversion rates for CBOD are measured in units of kilograms per cubic meter of beads per day (kg/m3-day). In general, the removal rate is controlled by the CBOD loading rate (kg-CBOD5/m3-day). For CBOD effluent qualities below about 30 mg/L the conversion rate is proportional to the effluent concentration. For example, for a domestic waste source, the unit’s removal rate has been observed to be 2 kg/m3-day at a target effluent concentration of 10 mg-CBOD5/L. At higher CBOD concentrations the removal relation tends to increase exponentially probably reflecting the increasing proportion of the CBOD5 that is associated with particulates. Removal of organic particulates greater than 30 microns is rapid. No biological activity is required, just capture and remove. Insight into the potential removal rate for any application is gained by analyzing a sample for soluble and particulate CBOD. Sludge production and handling is an issue anytime an aerobic process is used for BOD reduction as approximately 0.6 kg of biofilm is produced per kg of BOD removed (kg/kg). As part of their backwash cycle, PolyGeyser units shed, settle, and concentrate biosolids produced by the BOD conversion process. When a high-frequency backwashing is employed biodegradation of the biosolids (sludge) is minimized and perhaps 0.5 kg/kg of solids must be removed from the filter. Assuming a sludge concentration of 1% (10,000 mg-TSS/l), about 50 liters (13 gallons) of sludge is produced for every kg of BOD that is removed. For this reason, PolyGeysers designed for heavy BOD removal loads should be equipped with automated or pneumatic sludge removal. A means of the handling, treating and disposing of the sludge should be provided. Common practice is to discharge the sludge to an upstream clarifier. Most CBOD removal problems are addressed with filters configured to recycle water multiple times through a PolyGeyser. The need for recirculation is largely driven by the need to supply oxygen to the submerged bed. Recirculation also facilitates a longer contact time with the bacteria-laden bead media. Water is in contact for only about 20 seconds in a single pass through the bed. During this 20 seconds, a heavily loaded filter will consume most of the oxygen in the water dropping the concentration from around 5 mg/l to below 1 mg/l. Recirculating the water repeatedly through the bed can increase the oxygen supply to the 6-10 kg/m3-day range demanded by a heavily loaded filter. CBOD removal rates are typically 2-3 times the heterotrophic oxygen consumption rates. Recirculation rates are normally set at 10 gpm/ft3 but can be reduced to conserve energy whenever oxygen demands allow. The RCPG series has a recirculation tank built into the unit to facilitate recirculation. The units employ energy efficiency using airlifts to recirculate and aerate simultaneously in a low head (typically 4-6 inches) recirculation. The HPPG series can be configured with a packed tower for an adjoining tank, however, lifts are of the order of 10-15 feet. LPPG units can be configured with airlifts and a matching tank at the same elevation. These units are ideal for treatment of organically rich waters that are relatively free of fixed suspended solids. Total BOD (TBOD20 or TBOD5) will be impacted by the particulate removal, by the heterotrophic action on dissolved organics, and by removal of ammonia/nitrite by nitrifying bacteria. Carbonaceous BOD (CBOD20 or CBOD5) is impacted by the particulate and dissolved organic removal, but not the nitrifiers as their activity is suppressed in the CBOD test. All bead filters nitrify even at high organic loadings as long as oxygen is present in the bed. It must be presumed that a nitrifier seed is available in any effluent sample collected, thus inhibition (CBOD) is required to get an accurate assessment of organic reduction. This is particularly important when attempting to comply with stringent effluent standards. COD is composed of readily biodegradable BOD and refractory organics that resist bacterial attack. COD reduction with a floating bead media filter is accomplished by the removal of organic particulate matter (TSS removal) and through the bacteria oxidation of biodegradable dissolved organics (BOD removal). Refractory organics are best attacked by a pretreatment with ozone which allows the bead filter removing molecular fragments and precipitates that may be formed in the ozonation process. AST’s line of bead filters provide an excellent format for the aerobic nitrification process. This process results in the conversion of ammonia to nitrite by groups of AOBs (Ammonia Oxidizing Bacteria) and of nitrite to nitrate by groups of NOBs (Nitrite Oxidizing Bacteria). Volumetric conversion rates (g-N converted/m3-day) high often exceeding 1,000 g-N/m3-day for higher effluent targets (>2mg-N/L). Below 2 mg-N/L conversion rates are proportional to the ammonia concentration. As with all biological processes, the effective nitrification is dependent on management. The biofilm can be managed by frequent backwashing to shed heterotrophic bacteria exposing the nitrifier rich layers near the bead surface. Typically ammonia rich waters will contain dissolved particulates that stimulate the growth of fast-growing heterotrophic bacteria. The nitrifiers tend to dominate the biofilm layer nearest the bead surface and the heterotrophic bacteria tend to grow over the top. As the filter is exposed to more organics either through a short exposure of high organic concentration or an extended exposure to a moderate organic concentration, the heterotrophic bacteria will tend to cover the nitrifiers forming a barrier slowing oxygen penetration. At this point, the unit must be backwashed scouring off the heterotrophic overgrowth. Backwash frequencies for propeller-washed filters are limited by the severe damage a high speed propeller can inflict on a biofilm. 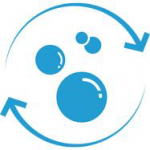 Peak nitrification conversion for a nitrifying PolyGeyser can be as little as every 2-3 hours. Nitrifiers are strict aerobes, they cannot function without oxygen. A nitrifying bead bed consumes oxygen very rapidly, theoretically, 4.3 milligrams of oxygen for each milligram of ammonia oxidized. It is not uncommon to observe a bead bed removing all the dissolved oxygen in the wastewater in the 20 seconds it takes for the water to pass through it. Flow rates through a bead filter operated for nitrification must be high enough to provide mass transport of oxygen to the submerged bed. 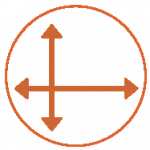 Flow rates in the range of 5-10 gpm/ft3 are usually required for high rate nitrification. Source water is assumed to have 5-6 mg-O2/L. The nitrification rate is influenced by the pH and alkalinity. Optimum nitrification is associated with pH values near 8. The process is slowed when the pH drops below 7.0 a condition typically associated with an alkalinity below 100 mg-CaCO3/L. Nitrification continues but is clearly impaired whenever the pH drops below 6.5 (typically alkalinity < 50 mg-CaCO3/L). Although some adaption of biofilms can be expected for biofilms continually exposed to low pH or alkalinity conditions, nitrifying filters should be managed to keep the pH above 7 with alkalinities above 100 mg-CaCO3/L. Denitrification is triggered whenever the oxygen content in a bed of EN media falls below 1 mg/L while in the presence of organic material (“carbon”) that can serve as an energy source for heterotrophic bacteria. Some heterotrophs only denitrify while others have the ability to switch from oxygen as an electron acceptor, or in the absence of oxygen to nitrate (NO3–). Whereas oxygen is converted to carbon dioxide, nitrate is converted to inert nitrogen gas (N2) through a few enzymatic steps. This process is probably unavoidable at some level within a heavily loaded bead filter and certainly occurs spontaneously in PolyGeyser sludge storage basins when thick (carbon-rich) sludge accumulations inhibit oxygen transfer. The behavior of the bead bed is controlled by the conditions it experiences. The same filter can be flipped back and forth from aerobic nitrification and denitrification in a relatively short time frame just by controlling oxygen levels. In many cases, the bottom of bead bed will nitrify while the upper portion (void of oxygen) will denitrify simultaneously. Encouraging denitrification in the fixed film bead bed generally requires that the carbon source is introduced while the oxygen supply is driven down. 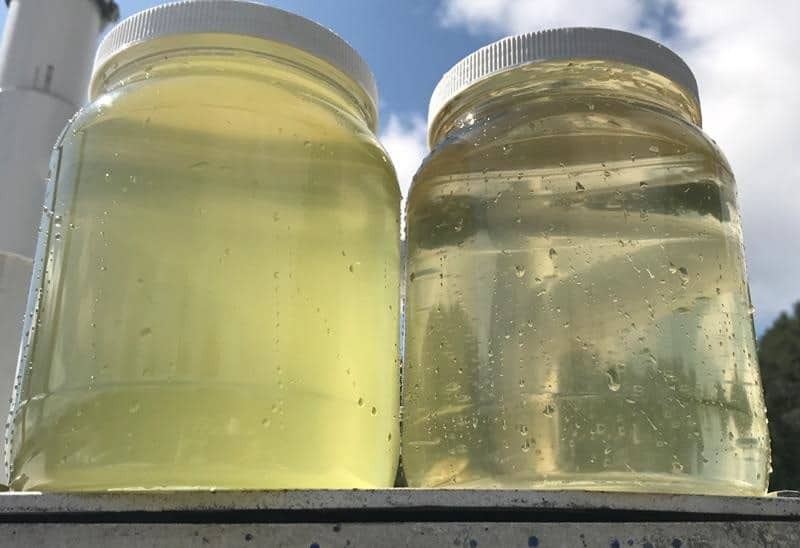 The latter can be accomplished by purging the in-flowing water with nitrogen gas, or by using the oxygen-depleted effluent from an aerobic filter as the influent to the denitrification unit. In fact, the denitrifying bed itself will usually finish the job of oxygen removal. It is important to note that marginal oxygen levels (near 1 mg/L) can cause incomplete denitrification resulting in nitrite accumulations, an undesirable outcome. Carbon source enhancement is usually accomplished by the introduction of a soluble carbon source into the wastewater ahead of the denitrifying bed. Common carbon sources for denitrifying beds include methanol, ethanol, sugar, and molasses. Compact, Small Footprint - Smaller pumps paired with an efficient design save space in both small and large volume applications. 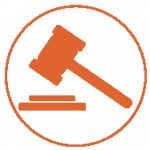 Meet Tough Regulations - Save on costly fines by ensuring EPA standards are met. Superior Clarification - Remove 100% of particles greater than 50 microns and 30% of particles greater than 5 microns. Bead filters are a very versatile tool for the industrial sector with applications such as pretreatment of water supplies, integration into the production cycle, wastewater treatment, runoff treatment, cooling towers, and water recycling. Applications can be as diverse as algal harvesting to mineral recovery associated with mining operations. Use of the units as a roughing filter takes advantage of the units’ robust resistance to biofouling. A typical HPPG or Propeller Bead® application is used as a solids removal device to reduce high suspended total suspended solids levels (300-1000 mg/L) down to a level that can be discharged into a domestic sewage system without penalty. Simple solids removal can show dramatic improvement in BOD as well as TSS levels whenever the solids are principally organic. The RCPG application is more appropriate whenever dissolved organics (soluble BOD) removal is required. The recycling capability permits oxygen transfer to be increased while extending the contact time with the biofilms. Typical roughing applications include mixed industrial wastes, food processing wastes, sludge lagoons overflows, wash down waters, and landfill leachates treatment. In many low flow applications, a bead filter can be used as a single step treatment in preparation for reuse or discharge. 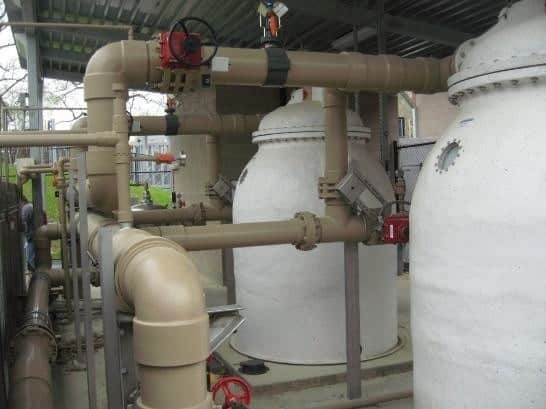 Process water for example that is contaminated with fine solids can be polished for reuse, and wash down waters that may contain a wide variety of contaminants can be concurrently treated to achieve a water low in both organics and particulates. Other applications with higher flows or dissolved compounds that are not impacted by biological decay utilize the bead filter as a tool in a treatment train to attack specific contaminants. For example, an industry with a wastewater treatment plant that must now meet more stringent effluent standards that include ammonia can use an RCPG to specifically attack this parameter (See Nitrification). The RCPG series with airlift recirculation is ideally suited to polish marginal ground waters of iron, sulfide, and ammonia often associated with anaerobic sources. The RCPG’s internal airlift in these applications not only aerates, but is also effective at carbon dioxide stripping that raises the pH. Bead filters can polish waters prior to subsurface injection through well screens, leachate fields, or subsurface micro-irrigation systems. With excellent suspended solids capture (TSS removal) and organics reduction capabilities (BOD), the bead filters can simultaneously eliminate clogging potential due to direct straining of particles and biofouling. 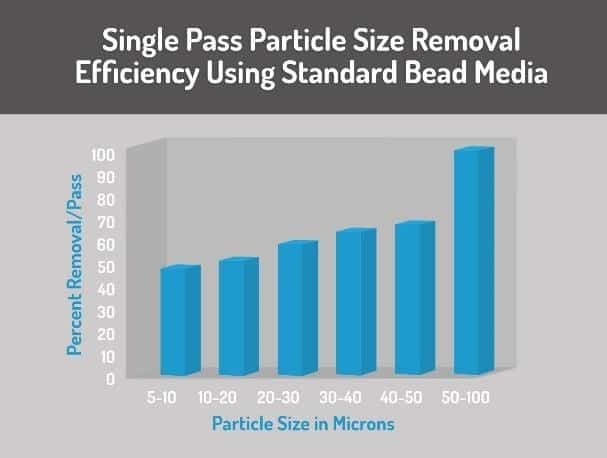 Bead filters can capture particles above 50 microns across a wide flow range, and provide protection against fouling episodes driven by infiltration or runoff. The units can play an integral role in the preparation of water destined to be injected as a disposal technique. Indifferent to heavy organic or solids loading, the bead filters can be placed virtually anywhere along a treatment sequence providing excellent solids reduction and contributing to the organic reduction required prior to deep well injection of fracking wastes. Here the bead filters are typically protected from oils, by a flotation process (dissolved air flotation), replacing much larger gravity clarifiers and/or sand filters that are subject to biofouling. AST bead filters are particularly well suited to the treatment of domestic wastewater flows that are characterized by moderate concentrations of suspended solids (TSS<300 mg/L) andBOD5 concentrations (BOD5<300 mg/L). 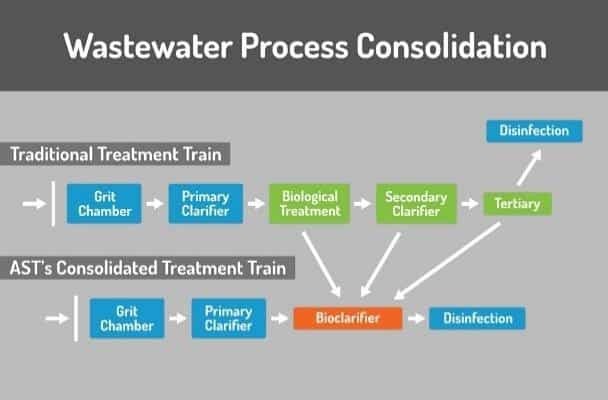 With minimal protection provided by a bar screen and perhaps a grit chamber, the units can be placed anywhere in the treatment train to accomplish either a solids removal or biological filtration. Our filters can be directly applied to the pretreatment of surface or groundwaters that may be used for a variety of agricultural purposes. A second agricultural bead filter application is the treatment and/or polishing of water discharged from aerobic and anaerobic lagoons for the purpose of meeting discharge standards. In this scenario the units can be used to meet the commonly targeted parameters of TSS, BOD, or ammonia reduction. Bead filters can be used to complement a primary clarifier reducing TSS and CBOD5 for direct discharge in the face of stringent effluent standards. They must be configured in a recirculating format to supply oxygen, and flows must be decreased to assure proper contact times, but an RCPG unit is capable of accomplishing almost complete treatment (disinfection will be required) in a single step. This effectively collapses the secondary biological treatment, secondary clarifier, and potentially tertiary polishing into one unit. 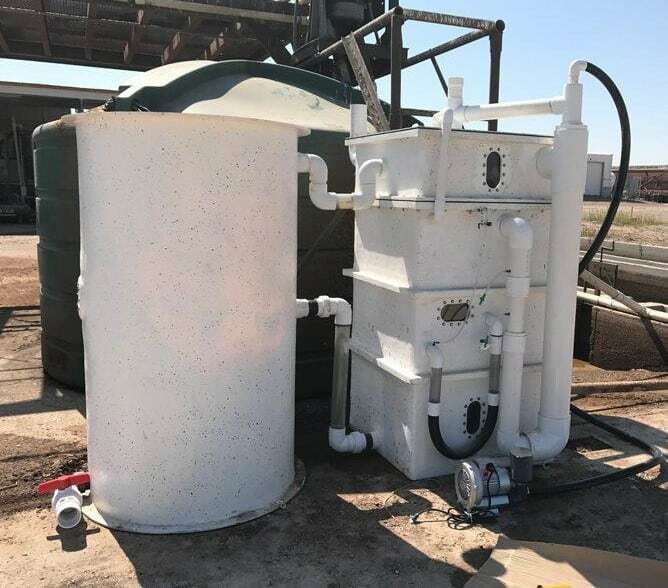 In these applications the primary clarifier usually serves a dual purpose, storing sludge generated by both the clarifier and bioclarifier functions. This is an approach that is attractive for small flows that must be treated remotely. Bead filters can be also employed to upgrade an existing plant most commonly for the polishing of suspended solids, CBOD5, or ammonia as a tertiary polisher for a mechanical plant, wetland, or lagoon system. Fixed film operation of the unit provides additional stability to the cold water nitrification capabilities of a suspended growth system. Effluents of wetlands, normally low in BOD, can be protected from the discharge of autonomously produced particulate organics that can lead to violations of suspended solids criteria. Treatment of lagoon effluents with bead filters can dramatically improve effluent quality although this goal is frequently challenged by ever-changing algal populations. Whether a lagoon is dominated by heterotrophs or phototrophs a RCPG unit will always provide nitrification when needed. AST bead filters are a useful tool on modern farms that want to practice good water management. In some applications bead filters are simply used as filtration devices removing particles above 100 microns that would otherwise clog downstream spray heads. More commonly they are used to reduce organic levels that would cause downstream biofouling or create unhealthy conditions for animals. Floating Bead Filters or Static Low Density Media Filters have been used for the past 25 years to replace clarifiers, sedimentation basins, and sand filters. Since the first filter was used to replace a sand filter in the aquaculture industry, our filters have been used in a number of industries to improve process operations, remove solids, improve wastewater quality, and reduce water loss all with low head loss and lower operating costs. The filters have been used as primary and secondary clarifiers, tertiary polishers for solids and nitrification, ground water remediation, municipal and industrial water reuse projects. Our filters come in many standard sizes or our experienced engineers can help design the perfect solution to meet your needs. Bead filters can be used as bioclarifiers in wastewater treatment to replace biological treatment as well as secondary and tertiary clarifiers. By consolidating operations within traditional treatment trains, bead filters achieve superior solids capture, plus biofiltration in a smaller footprint. 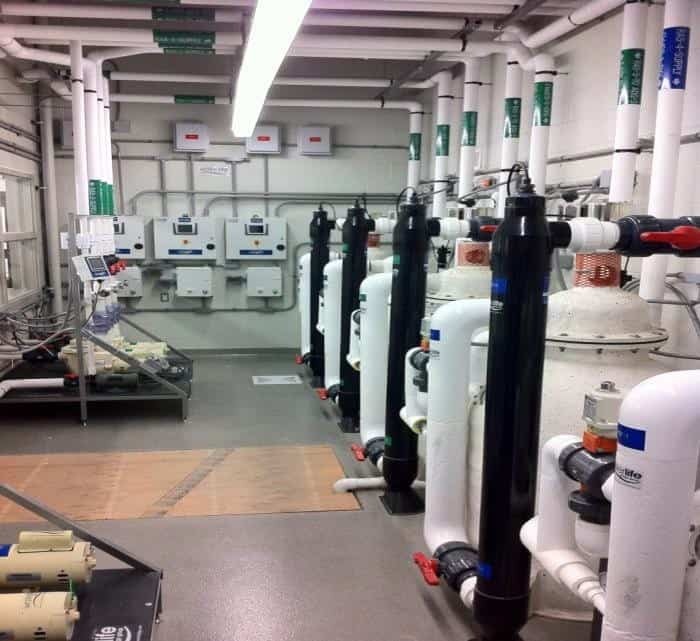 All of our filters have a higher flux rate at 28,000 GPD/ft² compared to traditional clarifiers or sedimentation basins that have a flux rate of around 800 – 1,200 GPD/ft². This flux rate allows our filters to have a much smaller footprint and thus fit into more applications or retrofit into your process for improved performance. The filters also have far superior solids capture ability with nearly 100% of particles 50 microns or larger removed and can remove 30% of particles in the 5-10 micron range. The efficiency of our solids captured combined with our small footprint allows our filters to be compatible with many applications from secondary and tertiary treatment, to removing particulates from process water, prior to membrane filters to reduce filter operation and maintenance costs. Our units also function effectively as a fixed film bioreactor. With proven results greater than 3 Kg of BOD/m3 of biomedia, our filters are powerful units that can handle a large variety of wastewater applications and are resistant to biofouling. Pneumatic backwashing frequencies can be adjusted to prevent biofouling across a wide variety of mean cell resident times, thus, the unit can be use to attack readily digestible to refractory organics across a wide variety of industrial, agricultural, and domestic applications. AST was founded in October 1995 to manufacture and market “Bead Filter Technologies” which were first developed at Louisiana State University’s Civil and Environmental Aquatics Systems Laboratory in the early 1990s by Dr. Ron Malone. Today, AST’s product line features a variety of different filtration products utilizing Bead Filter Technology. These products can handle a wide range of filtration needs and span a variety of industries. AST’s main office has been located in New Orleans for 20 years and recently opened an office in Louisville, Colorado and is represented by Pure Aquatics in the Australian and New Zealand regions. 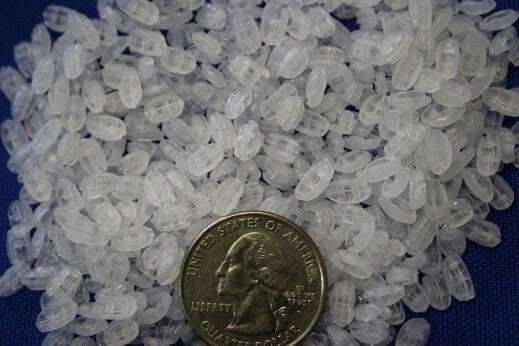 Bead filters are generally classified as “expandable granular biofilters” or EGB’s and are distinguished from other filters by the use of plastic floating granular filter media. Water from the aquatic system passes through the packed bed of plastic beads. The beads capture the solids, while simultaneously providing a large surface area (400 ft2 /ft3 ) for the attachment of both heterotrophic and nitrifying bacteria which remove dissolved organic and nitrogenous wastes. Bead filters are often referred to as bioclarifiers for their ability to perform both bio-filtration and clarification in a single unit. Bead Filters were originally invented to overcome some of the major problems with using traditional filters. In fact, bead filters comply with three of the major sustainability issues summarised in the LEED Green Building Rating System. Bead filters operated with water pumps typically operate at low pressure (horsepower requirements, as well as energy consumption). Bead filters specifically designed to use airlift pumps for circulation operate with less than 1 psi head loss. Additionally, backwash water loss rates for Propeller Bead® Filters are as low as 10% and PolyGeyser® Bead Filters are as low as 1% of those experienced by typical sand filters. Bead filters are also easily automated, never require replacement of the filter media and are immune to caking and channelling when back-washed regularly.